Time Table For IIT JEE: Planned and focused study is very necessary for any student to score high. Along with the overall planning, the daily schedule is also very important. Thus, preparing a realistic and effective timetable is very important in order to utilize time productively. It doesn’t matter if you have 1 year, 3 months or just a single month left for the IIT JEE Advanced no matter how much time you have left, you have to plan on how to spend it effectively. In this post, we aim to help you come up with the best timetable for IIT JEE. First things first, you need to have a timetable that works. So let’s put our heads together and devise the best timetable that will help you achieve your IIT JEE goals. You now know which chapters you need to cover and how many questions you need to solve. So plan your day in such a way that every portion of the syllabus is covered. Most students have one subject they are weak at or one subject that they are very strong at. It is important to give the least amount of time for your strong subjects. If, for example, Physics is your strength, then you need less time to study it. Students think that they will do well enough in their best subject and average in other subjects and clear the JEE. This is the biggest mistake they make. You should aim for getting equal marks in all three subjects. Why? Because what you are worst at is where you have the most room for improvement. If you don’t know cricket, you can start playing cricket today and see that in 6 days of hard practice you have shown a lot of improvement. But Sachin Tendulkar is already so good that he won’t notice much improvement in his game even after 6 months. Do you want to clear the JEE Main, or qualify for JEE Advanced, or do you want a seat in IIT? You have to be very clear about your goals if you want to be able to plan for them. You don’t need to study the entire syllabus to crack the JEE. Here is the important part. The time left does not affect your preparation strategy! This is because your preparation will always only depend on which are the easy chapters with the highest weightage. You can download a pdf of the chapters distributed by weightage and difficulty (input). The iron rule is this – Do the high weightage and easy (low input) chapters first. Once you are thorough with these chapters, move onto the more difficult but high weightage chapters. How do you do that? Solve at least 100-300 JEE Advanced practice questions from each chapter (100 questions for easy chapters, and 250-300 for difficult chapters). That’s the best way to be extremely thorough with a chapter. Just theory will not be enough. You need to keep solving questions until you are able to solve 80% of all JEE level problems quickly enough. That can only come with practice and it’s time to get going with it! With Embibe’s RANKUP, this type of practising becomes easier. On RANKUP, you can select any number of topics that you want to improve, and RANKUP generates practice packs for you that contain important questions and previous years’ questions from the selected topics. Also, based on your performance in tests, RANKUP generates personalized practice packs which helps in improving your weak areas. 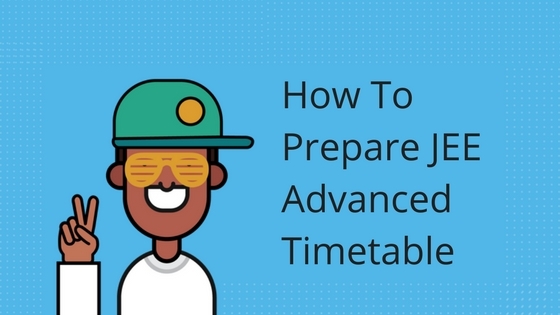 We hope this article helps you to prepare your JEE advance timetable. If you have any questions feel free to post it in the comment box below. We will get back to you at the earliest. What is the best time to give mock tests?